Gourmet House Ltd. was founded in Hong Kong in 1994 by Jurg Meier together with Betty Liu and Rene Frauenfelder. In 2008, Gourmet House Macau ltd. it started its business in Macau, and it was one of the pioneering, if not the very first, corporate who freshly produce quality chocolate locally at that time. Gourmet House Macau now owns 2 other associates – Kam Mun Tong Food Factory and Schoggi Meier Patisserie & Chocolaterie. We provide chocolate, cakes and bakery products to various 5-star hotels, restaurant, coporate. We also provide tailor-made cake, chocolate & bakery product to personal needs. 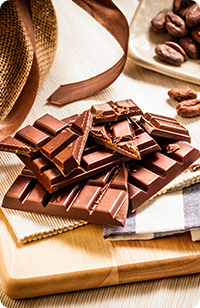 Our chocolate raw materials come from quality-proven origin, such as Switzerland and France. With wide range of variety, chocolate, macaron and cookies for instance, we are your first choice of gift box in different occasions such as wedding, festival, etc. We also provide tailor-made gift boxes, serve as corporate gift as well as for wedding, birthday, anniversary, etc., which will perfectly fit your special occasions & needs, and ensure you & your guest be delighted. We have a cake shop and a dessert bar where you can buy our products anytime. You are welcome to place your specific orders such as wedding cake. (See more at "Our Shops").